I have now introduced on various levels of conceptual resolution the two key aspects of the theatrical events I am to investigate—agents and objects—and argued that the valid metaphor for such investigation is not some version of a Great Chain of Being but the intricate cognitive ecology of their relationships. In this chapter, I zoom out from agents and objects to the eventness of their relationships in performance, as afforded by tangled reciprocities of agency, skill, environment, and technology. 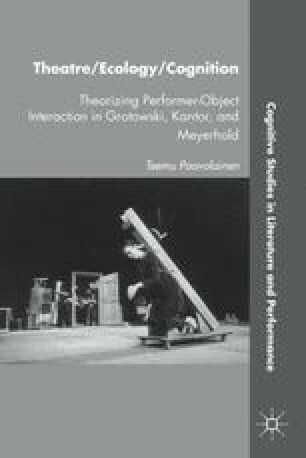 The production I use as a case study counts among the emblematic events of early twentieth-century avant-garde: Staged in Moscow in 1922 by director Vsevolod Meyerhold (1874–1940), The Magnanimous Cuckold claimed its renown with the twin innovation of its “constructivist” setting and, as its ecological counterpart, if you will, its “biomechanical” style of acting—both in the glory of the October Revolution and of machinelike efficiency. Yet this twin perspective has also rendered its social implications intriguingly indeterminate: concentrate on the actors, “making do with the simplest objects which came to hand” as Meyerhold suggests, and indeed the production seems to have embodied “the socialist transformation of work into fun” (Christopher Baugh)—“the new man freed from the power of things, from the power of an inert immobile environment” (Boris Alpers). Take a cultural materialist look at Lyubov Popova’s landmark scenography, however, and Meyerhold’s workers soon appear “themselves machined by the machines-for-acting they appear to operate,” as W. B. Worthen argues.1 Out of constructivism (prototypical of the theatre of objects) will come Kantor, out of biomechanics (prototypical of the theatre of the actor), Grotowski. The framework attached to the rear of the right mounting consisted of vertical, horizontal, and diagonal supports. It rose above the platform and extended slightly beyond the sides of the mounting … Behind the construction and at some distance from it, a service mounting was located for supporting the three wheels: the smallest, a red wheel above the left platform; an unpainted, medium-sized wheel behind it; and beyond them, the largest one, a black disk, that extended beyond the framework at the right. On the black disk, in white-painted Latin letters, were the consonants making up the last name of the playwright: CR-ML-NCK.